The place for “techies” and others to NOT talk tech! Early this month I blogged about Another Reason to Ride, and here it is late in the same month and I am again reminded of why I ride. People ask us often why we would put ourselves through the grueling effort of training and conditioning, never mind the time investment that it takes to ride the Pan-Mass Challenge route from Sturbridge to Provincetown on an often hot weekend in early August. In addition, when a rider commits to a ride, each rider commits to a certain fund-raising minimum which is not a trivial amount. Fund-raising without corporate donations is often the most difficult as the average donation is smaller. A rider really puts themselves “out there” to ask everyone they know for donations to support the cause. However, often the “…Reason to Ride” becomes close to home with the diagnosis of a close family member with Cancer. That is what happened to me yesterday as I found out that my niece Sherri who lives in Missouri is undergoing chemo and radiation treatment for lung cancer. I ride “In Memory of” Karl Nawskon, nephew who died of pancreatic cancer about a year ago, and I ride “In Support of” Sherri Ehlenberger as she battles her lung disease. Training and riding the PMC is nothing compared to battling cancer. I ride in the hope of making cancer history. Please support my ride at this link Donate to Joe Coley’s Ride. Team ThreeG3N has now been formed! Comprised of three generations of Coley’s and a family friend, the team has begun their efforts to train for the 180 mile, 2 day ride from Sturbridge, MA to Provincetown on Cape Cod. You are encouraged to visit our team website ThreeG3N to see all the latest and to follow our efforts as we train and continue our shameless fundraising for the Dana Farber Cancer Institute Jimmy Fund. The team fundraising goal is to raise $20,000. It’s early in the New England season, but if the road conditions permit, and the temperature stays above 40 long enough, outdoor riding using the mountain bike can happen — and a couple of times this year it has, yesterday being my second ride of 2014. It’s a start toward the ultimate goal of riding the 2-day Pan-Mass Challenge this coming August 2nd and 3rd. I expect that I will be uploading each of my rides using my new GPS-enabled sports watch. Yesterdays ride can be seen at February 1st Ride. I’m anxiously awaiting the registration of the rest of my team so that PMC Team ThreeG3N (Short for 3 generations!) can be officially formed. Team ThreeG3N will consist of three generations of Coley riders, myself, my daughter and my grandson — and a friend of my daughters. While it is still early in the season, the fundraising on my part has begun. On-Line donations can be made at Joe’s Donation Page. The weather was gorgeous :-), the riding a joy, the spirits high and the “saddle” time — let’s just say, a long time. My ride statistics for this year are posted at JoeColey’s PMC Volunteer ride. This years PMC had riders from 38 states participating. Volunteering was a joy. This year I was fortunate enough to have met up with a fellow rider along the route who was struggling to keep up with the group of much more experienced riders that she started with. We began chatting as we peddled, getting further behind the group she started with and as time went on became riding partners, and completed the ride together. It was wonderful to have a riding partner! Saddle time on a long ride just passes much more quickly when pedaling with another. Her goal for the ride was just to finish — she had no expectations for time, just wanted to ride to the best that her limited training on a friends borrowed bike would allow. For me, riding with her kept me from constantly pushing my own limits, thus conserving my energy so that I felt great after the ride! Thank you Beth! What Can Be Said When Cancer Kills? There is so much more that we need to learn about cancers. 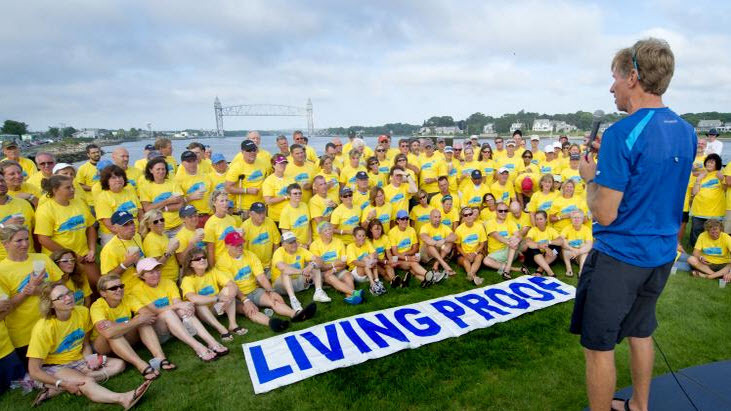 Yes, there are many very active people who provide “Living Proof” of cancer survival. I am very glad to be one, as is my wife. Yet we do know, cancer also kills, leaving behind many shattered and broken hearts, mourning the loss of a loved one. That was my weekend last. 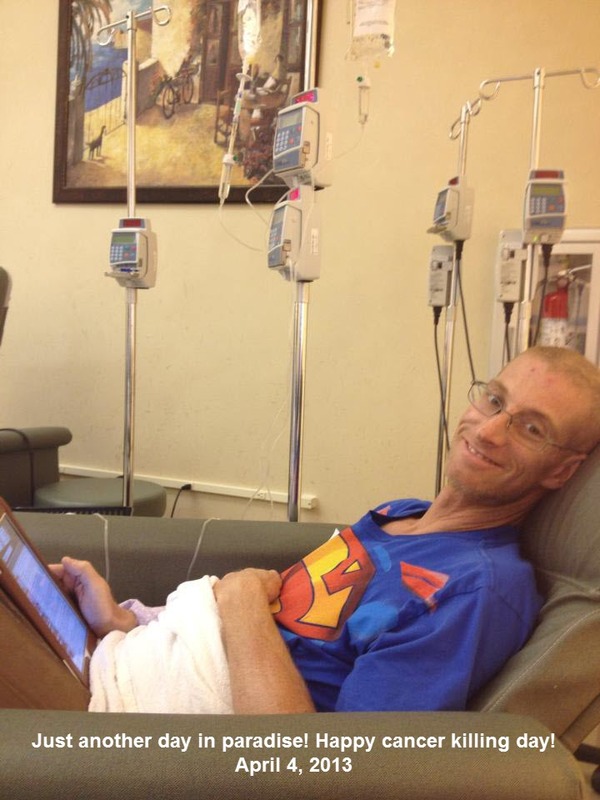 At 40 years old, Karl Nawskon’s Fight Against Cancer ended. All who knew and loved him are left with the memories of his “Superman” attitude. If anyone could beat Pancreatic cancer, we were sure it would be Karl, but that was not to be. This coming weekend is the annual Pan-Mass Challenge ride to raise funds for the Dana Farber Cancer Institute and the Jimmy Fund. Last year the combination of riders and volunteers raised $37 million dollars, and this year our goal is to increase that to $38 million. Most who volunteer or ride have had cancer come too close. Many are cancer survivors themselves. Many ride in memory of a loved one who has succumbed to cancer. This year I ride in Karl’s memory. If you can possibly do so, please donate to my ride at this link “Joe Coley’s PMC Ride“. The rain continued to threaten, drizzled some, but not a washout and I got in my 50 mile ride. While in Cumberland, Rhode Island a group of 8-10 riders passed me who were also on a training ride for PMC weekend. There were a number of groups of riders seen today. Once again I was reminded of the value of riding with a group. It’s very different than riding alone as my rides usually are. After some 40 miles of riding I found myself beginning to really struggle for no apparent reason — then I noticed my front tire was soft, a problem which I have been dealing with for my last few rides. We (my bike mechanics and I) thought we had the problem resolved, but that remains to be seen at this point. In order to continue I had to use my little bike pump, which is truly limited for just how much pressure it is capable of producing when I’m using it. (I acknowledge that someone with more strength than I might produce better results ). In spite of the equipment problem I was satisfied with my ride, and have no qualms about riding the 80 mile PMC ride on August 4th. Sometimes the best made plans just don’t work out. I had my ride all planned out for this morning (53 miles), but have chosen not to ride early, and instead wait for the rain to clear out. Looking at the radar, most of my chosen route for this morning is currently in rain. As I was preparing myself to get on the road I thought I’d take a quick look at the weather radar and see if I might run into some rain. Well, right about the time I did I heard rain — Oh well, hopefully I will be able to start riding in another hour or so. My destination hasn’t been wet at all. I’m trying to get a final long training ride in before the PMC weekend on August 3rd and 4th. The Rest of the Story – A Dana Farber Experience for Me! I didn’t think I needed additional incentive to support the Dana Farber. However, I got it — On April 23rd I had surgery under the expert hands of a Dana Farber Thoracic surgeon. From Dana Farber supporter to Dana Farber patient in 8 short months. I was the fortunate one, the spot seen on my lung which was the concern and reason for the surgery was NOT CANCER! My recovery was amazing, and I was on my bike within a week of the surgery – no noticeable change to my lung function in spite of the surgery. Being faced with the unknowns around the surgery, that is why it took me so long to register for one of the PMC rides – but all is well! Today was a 2 thumbs up weather day, and I had the bike wheels turning by 6AM. Todays ride was a demanding 33 mile ride with just shy of 2500 ft. of climb — it was my most difficult ride since starting my training in early May. Total miles to date – 214. You may support my ride by clicking this link to Joe’s PMC Ride. To see my route today click Here. Well, the weather finally broke into some reasonably decent riding weather, with the exception of a 15-25 mph wind seemingly swirling and making my 15 mile ride today that much more work. I’m off to a slow start with my training for my 2013 PMC ride as the result of surgeries, beginning at the start of the year with quad tendon repair on my right leg. Building up the strength for my ride this year (toned down to an 80 mile, less hilly ride) is a key goal at this time. Yesterday my muscles certainly had a good workout fighting the wind, which no matter what direction I was heading, always seemed to be trying to make me work harder. I’m sure it was a personal thing :-). As of a few minutes ago I have officially registered to ride the 80 mile PMC ride in support of programs and research at the Dana Farber Cancer Instutute. You may support my ride by following this link http://www2.pmc.org/profile/jc0572, and keep following this blog for more about my ride, and some additional information that will surprise you. Thank you for your support!